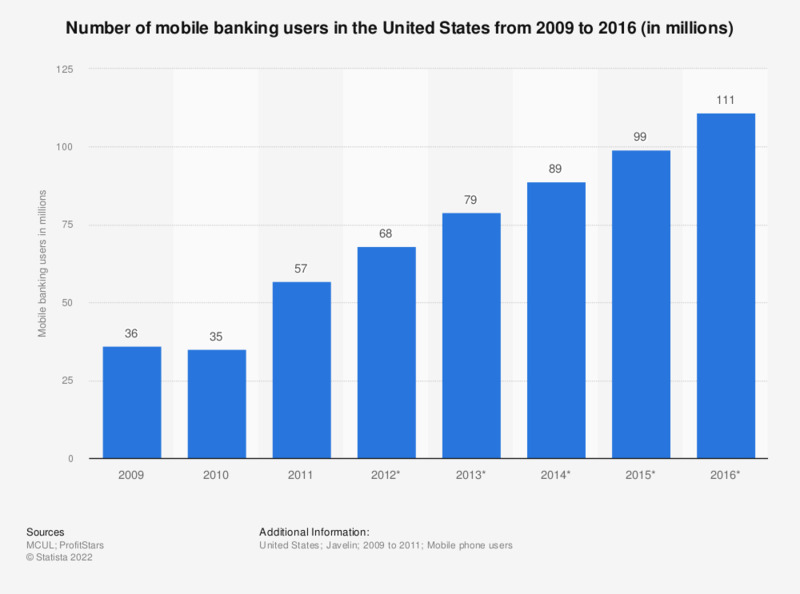 This timeline displays a forecast of the number of mobile banking users in the United States up to 2016. By 2014, it is predicted that 89 million people will be accessing mobile banking services on their mobile phones. The number of smartphone users in the United States increases each year and with increasing penetration, smartphones are changing the way we do just about everything – including banking. In 2009, as few as 36 million people were using mobile banking services. By 2016, it is expected that 111 million people will use the service increasing from an 18 percent share among mobile phone owners to a 51 percent share in 2016. Younger generations are of course the first ones to jump on and take advantage of the service; older generations will need a bit more time. What typically makes mobile banking most appealing is the convenience of it, it saves time and it can be done at any hour. Common reasons for not using the service include: banking needs already being met by the traditional system of banking, a lack of reasons for using it and because users are concerned with the security of the service. However, with time and increasing penetration it will become more and more appealing. Furthermore, it is not only banks that are providing their customers with mobile banking services, but entirely new mobile banks. A mobile bank is essentially an application, without a physical branch and without the fees of traditional banking.